Biscuit is a Pinto pony gelding foaled in approximately 1998. Brady is a Palomino pony foaled in approximately 1986. 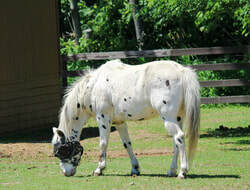 The two came to Horses' Haven as an owner surrender. The previous owners rescued them from an auction, but, after a life change, could no longer keep them. Brady is happily retired, but we believe Biscuit may be cart trained; we are still evaluating the extent of his skills. We would love to see these two find a Forever Home together if possible. Danny is a POA (Pony of the Americas) with an approximate foal date of 1997. He is completely blind and came to Horses' Haven because he was being picked on by the other horses at his previous home. He couldn't see trouble coming and defend himself. Not fair! Now he shares a pasture with our mini donkeys who wouldn't dream of picking on him. Gizmo is a chestnut pony mare foaled in approximately 2001. She was very pregnant when she came in as a neglect case from Presque Isle county. She was one of 33 animals seized by the sheriff's department in October 2012. She was extremely timid and shy upon arrival and has come very far in terms of her trust of humans. Gizmo needs a very small rider to finish her under saddle work. Heidi is a pony mare foaled in 1985. She came to Horses' Haven in Nov. 2008. Her owner's children had outgrown her and they didn't want her any more. Here she has lots of "kids" to look after since she hangs out with many of our goats and she is definitely wanted. Heidi went blind before arriving, but you'd never know it by the way she gets around her pasture so well. Kitty is a pony mare foaled in approximately 2008. 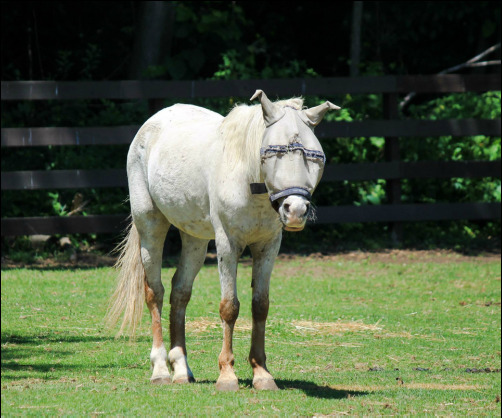 She was rescued from an auction kill pen and surrendered to Horses' Haven when her rescuers realized they were not prepared to rehabilitate her from her past trauma. Kitty is currently under evaluation and is working on building her trust with humans. Rascal is a Palomino mini gelding foaled in 1993. He came to Horses’ Haven with his friends Echo and Isabelle after their owner passed away. Rascal was very well cared for, but is very shy and has recently lost his sight due to a metabolic syndrome. Thunder is a POA gelding foaled in 1994. He doesn't see to well due to moon blindness, but is super sweet and very curious. He does still have some vision and makes a great companion.